The aim of the program evaluated in the present study was to improve the well-being of students, teachers, and staff by partnering an elementary school with a local social enterprise to incorporate dual yoga and mindfulness programming into the school’s existing SEL program, with a specific focus on students who may be experiencing stress. Mindfulness and yoga were added to the school’s existing empathy-based programming to provide additional targeted intervention for students identified as being in need of supplementary support. The study also sought to provide tools for teachers to use for all students in their classrooms on an ongoing basis. This study aimed to assess whether mindfulness and yoga instruction improved quality of life more than the usual care the school provided among students identified as having symptoms of anxiety. A two-tiered study that included a randomized controlled trial of elementary school students receiving small-group yoga/mindfulness sessions and two post-test only examinations of health-related quality of life for teachers and staff, after each of two professional development sessions, took place between October 2016 and February 2017 at one publicly funded elementary school in New Orleans, Louisiana, USA. Yoga and mindfulness sessions were provided through a community organization by an experienced children’s yoga instructor who provided sessions to teachers, staff, and students. The students included in this study were third graders who screened positive for symptoms of anxiety, using the validated Screen for Child Anxiety Related Emotional Disorders (SCARED) scale30 administered at the beginning of the 2016 academic year. Following the receipt of parental consent and student assent, students were randomized to an intervention group with 20 total students, which received the yoga and mindfulness intervention, or a control group with 32 students, which received care as usual, including counseling and other activities, led by the school social worker. All 52 students were given a baseline survey in which their basic demographics, prior experience with, and feelings about yoga and mindfulness, and quality of life were assessed. Teachers and staff had two professional development sessions about including yoga instruction in the classroom. They were surveyed following each of the professional development sessions. These surveys assessed teaching experience, prior yoga experience and attitude toward yoga and mindfulness activities, experience with yoga in the classroom, and teacher’s quality of life. Study authors performed secondary data analysis on data initially gathered by the elementary school during an internal pilot study of their new curricular programming, and provided only de-identified data to the authors. The protocol was submitted and approved for secondary data analysis by the Tulane University Institutional Review Board. Procedures related to consent and assent relate to the original data collection performed by the school staff and approved by leadership. Students randomized to the intervention group participated in small-group yoga/mindfulness activities for 8 weeks led by a local social enterprise organization, using the validated Yoga Ed curriculum and materials. Yoga Ed is an evidence-based curriculum for utilizing yoga in the classroom and has been studied previously with children in schools.31 It includes the use of manualized and validated materials as the foundation of programs, which all meet national physical education and health standards, while also being uniquely designed to address core needs of educators and students. Students randomized to the intervention received a total of 10 in-person, group sessions, each lasting 40 minutes, for 400 total minutes. The sessions were conducted in an empty classroom, before the instructional day began for the students. The session content included breathing exercises, guided relaxation, and several Vinyasa and Ashtanga poses appropriate for third graders. An introductory professional development session on including yoga and mindfulness in the classroom was provided to teachers and school staff prior to the start of school year in the fall of 2016. All teachers and staff were invited to participate in an 1-hour professional development session to introduce a yoga and mindfulness curriculum that could be integrated into their classroom activities. Baseline information on teachers’ previous experience with, perception of, and interest in yoga/mindfulness, as well as quality of life and indicators of stress were obtained by the school for the evaluation. All teachers were offered a second professional development session about using yoga/mindfulness in the classroom, building on the previous session, before the start of the second phase of the student intervention. Data were collected from school students through three rounds. The first survey was given to students prior to randomization. The midpoint survey was given after the initial period of the yoga/mindfulness intervention had been completed. The final survey was given following the completion of the intervention by all participants randomized to the intervention group. Data collected from teachers included items from the Centers for Disease Control and Prevention’s Healthy Days Measures, which is a tool for measuring health-related quality of life.37 Questions assessed the number of days in the prior month that the respondent would rate their mental health as suboptimal, their physical health as suboptimal, and the number of days on which their mental or physical health prevented them from completing their normal daily activities. The student intervention and control groups were compared at baseline. Intent-to-treat (ITT) analysis was performed, with all randomized subjects analyzed according to their assigned group regardless of adherence to the intervention. Differences in frequencies for categorical variables were assessed with Pearson’s chi-square test, except where Fisher’s exact test was indicated, and differences in means for continuous variables were assessed using t-tests. Change in PedsQL and BMSLSS-PTPB scores was computed at both the midline and endline surveys, and t-tests were performed to test for difference in mean change between intervention and control groups. Generalized estimating equations (GEEs) were used to model the repeated measurement of the continuous scores. These models allowed for assessing change in exposure status of the students when they received the intervention. Additionally, GEEs accommodate correlation between repeated measurements within individual students.38,39 The models were adjusted for survey time at which the outcome was assessed, homeroom teacher assignment, and student interest/excitement for yoga at baseline. The p-values reported for GEE models are based on score tests, due to the anticonservative nature of Wald statistics with small sample sizes.40,41 Results with a p-value of <0.05 were considered statistically significant. SAS version 9.3 was used for all analyses (SAS Institute Inc., Cary, NC, USA). A comparison of the intervention and control groups is provided in Table 1. There were no significant differences between intervention and control with regard to demographic traits, prior yoga experience, the PedsQL score, the PedsQL subscores, or BMSLSS-PTPB score. The intervention group was significantly more interested in yoga, with 95% rating themselves very or somewhat excited to participate, compared to only 59.38% among the controls at baseline (p<0.01). Abbreviations: BMSLSS-PTPB, Brief Multidimensional Students’ Life Satisfaction Scale-Peabody Treatment Progress Battery version; PedsQL, Pediatric Quality of Life Inventory. No differences existed in the baseline BMSLSS-PTPB or PedsQL scores between intervention and control groups (Table 2). Mean group scores for the psychosocial PedsQL and emotional PedsQL are shown in Figure 1. Groups 1 (Fall) and 2 (Spring) both received the intervention, while group 3 received care as usual. All three groups saw improvement in psychosocial PedsQL from baseline to the midline, but none saw significant improvement from baseline to endline. Both intervention groups 1 and 2 saw net improvement in emotional PedsQL from baseline to endline (p<0.01), while there was no change in the control group. Figure 1 Mean student PedsQL psychosocial and emotional scores in intervention group 1 (fall), intervention group 2 (spring), and control groups from baseline, midline, and endline surveys. Notes: Statistically significant differences between intervention and control groups were observed for psychosocial PedsQL at survey 3 (p-value 0.03) and for emotional PedsQL at survey 3 (p-value 0.02). Abbreviation: PedsQL, Pediatric Quality of Life Inventory. Note: Data are presented as mean±SD. At the midline survey, those in the intervention groups had a significantly larger mean improvement in emotional PedsQL score (17.39 for intervention compared to 0.75 for controls, p-value 0.005). No other changes in score were significantly different between intervention and control, but physical, psychosocial, social, and overall PedsQL change was higher for the intervention group than for the control group. At the endline survey, a similar pattern was observed. The difference for emotional PedsQL achieved statistical significance, with an 18.27 unit increase in the intervention group from baseline compared to a 0.86 unit decrease in the control group from baseline (p-value 0.009). The results of the GEE models are shown in Table 3. In the model adjusted for the survey at which the outcome was assessed (Fall/Spring), the yoga-based intervention was associated with a 7.43 unit increase in student psychosocial PedsQL (p-value 0.01), and this association was only slightly attenuated and remained statistically significant following adjustment for homeroom assignment and baseline interest in yoga (p-value 0.02). Likewise, the intervention was associated with a 14.17 unit increase in student emotional PedsQL in the model adjusted for the survey at which the outcome was assessed (p-value 0.001). This was not attenuated by adjustment for homeroom assignment and baseline interest in yoga. Results were not statistically significant for the other outcomes, but in models adjusted only for survey at which the outcome was assessed, the yoga intervention was associated with nonsignificant increases in overall PedsQL and social PedsQL. Notes: aParameter estimates from generalized estimating equation models. Model 1, adjusted for survey at which the outcome was assessed. Model 2, adjusted for survey at which the outcome was assessed and student homeroom assignment. Model 3, adjusted for survey at which the outcome was assessed, student homeroom assignment, and baseline interest in yoga. *The p-values presented for the generalized estimating equations parameter estimates are type 3-score-test-based p-values. Bold values indicate significance. The teachers were also surveyed following two professional development sessions on yoga and mindfulness techniques in the classroom held at the beginning and end of the school year (Table 4). Teachers were asked about a number of potential barriers to implementing yoga in the classroom, as well ways yoga might help if introduced into the classroom. The results from the two professional development sessions were similar, with teachers and staff on average identifying nearly six ways yoga may help in the classroom including helping students self-regulate, helping students be calm, helping the teacher be calm, or improving the classroom climate. Teachers on average identified fewer than two potential barriers to introducing yoga such as being too busy with academic requirements or lack of self-confidence using yoga techniques. 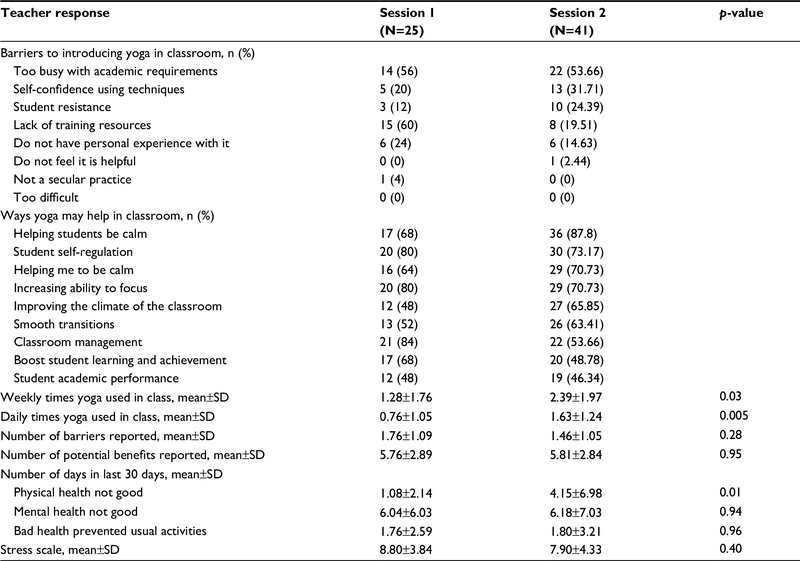 The number of times per week the teachers reported using yoga in the classroom increased from 1.28 to 2.39 (p-value 0.03) between the first and second professional development sessions, while the mean number of times per day the teachers reported using yoga in the classroom increased from 0.76 to 1.63 times per day (p-value 0.005). The self-reported physical health of teachers was significantly worse at the second professional development session (4.15 days in the past month where physical health was not good at the second session compared to 1.08 at the first session, p-value 0.01). Other metrics of teacher health were not significantly different between the two professional development sessions. Teachers reported feeling that yoga could be very helpful, with seven of the nine potential benefits exceeding 50% affirmative responses. The barriers most frequently cited as hindering the introduction of yoga into the classroom include being too busy with academic requirements, teacher’s lack of self-confidence using the techniques, and student resistance. The data presented indicate that students did benefit from this relatively short intervention, and that teachers and staff derived benefit as well. The students who received the intervention demonstrated significantly greater improvement in psychosocial and emotional quality of life compared with their peers who received standard care. Teachers reported many potential benefits of using yoga in the classroom and also reported using yoga in the classroom more days each week and more times each day following the student intervention. Students’ psychosocial and emotional scores increased as a result of participating in small-group yoga and mindfulness activities at school, and previous studies have not used the specific measures applied in this study. These findings are important because they provide educators with a set of tools that may benefit students dealing with emotional or psychosocial issues. The benefits highlighted in this study lend support to results from prior studies where mindfulness and yoga curricula decreased negative emotional responses and stress, and improved self-esteem in students,22,23 and benefited adults suffering from anxiety and depression.14–16 The improvement in psychosocial and emotional quality of life may reflect similar reductions in anxiety and stress among the third graders included in this study. Studies that only substitute yoga for other types of physical activities as part of a physical education program may not adequately incorporate behavioral approaches that support children to adopt the practice in their day-to-day lives. One study found no benefit to yoga when compared to physical education class for reducing stress.44 The lack of significant differences may be due to that yoga intervention failing to focus on stress management and/or the stressor tasks not adequately capturing attenuation of stressor response, where physiologic endpoints were used to assess stress reactivity, as opposed to quality-of-life measures, as used in the present study. In a study conducted among fourth- and fifth-grade girls, White reported that mindfulness intervention was associated with a significant increase in appraisal of stress score.2 White’s results were unanticipated, and contrasted with the results of the present study, may suggest some design issues. The prior study was composed of girls drawn from two schools, and randomization was performed at the school level, precluding any ability of the researcher to distinguish school-related changes in student stress from changes due to the intervention. Additionally, White’s study excluded students with prior formal yoga experience or a need for special educational support. In effect, the study was a cluster-randomized trial with a sample size of two (two schools), composed of school-aged white females without baseline medical or psychological diagnoses. The present study randomized individual students, included male and female children of diverse racial backgrounds, and the students were all determined to be at high risk for anxiety at baseline. This study has several limitations. Although the sample size was limited, with only 20 subjects in the intervention group, significant differences were identified between intervention and comparison groups. Additionally, the two intervention groups received their intervention at different times of the year. Student perception of their own quality of life may be subject to change during the course of a given school year, so the baseline on which the intervention was administered was not necessarily the same for both intervention groups. The intervention evaluated combined yoga and mindfulness, and this study is, therefore, unable to identify whether one or both of these components was responsible for the improvements in psychosocial and emotional well-being. This study has several strengths that deserve emphasis. The first is that the small-group yoga and mindfulness intervention was targeted to the needs of the children who were participating, and likewise, the training for teachers was tailored to educators of children in the local context. The subjects were randomly assigned to either the intervention or control groups, avoiding the self-selection of the exposure. The ITT analysis preserved the benefits of the randomization. The use of a previously studied yoga education curriculum allows the results of this study to be compared with others previously reported. Students’ quality of life was assessed using previously validated instruments designed for use in children. Finally, the data collected from teachers and staff will facilitate future research by helping ensure that it is tailored to address the concerns and suggestions of the educators. This study demonstrated that a yoga-based intervention in an educational setting can improve emotional and psychosocial well-being among third-grade students who screen positive for symptoms of anxiety. Further research should be conducted with diverse and larger populations, including additional age groups, to determine whether this improvement of quality of life remains, and whether the effects of yoga are applicable to a more general population of students. Yoga and mindfulness curricula may provide children at risk of anxiety with a skill enabling them to improve their psychosocial and emotional quality of life. These coping skills, when provided in the school environment, may assist students achieve optimum physical and mental health. The authors are grateful to Monique Kerrigan, Janine Murry, Jan Rice, and Sheila Nelson for their contributions; and to the Tulane University Center for Public Service, and Taylor Center for Social Innovation and Design Thinking for support. Skybo T, Buck J. Stress and coping responses to proficiency testing in school-age children. Pediatr Nurs. 2007;33(5):410, 413–418. White LS. Reducing stress in school-age girls through mindful yoga. J Pediatr Health Care. 2012;26(1):45–56. Horowitz JA, Vessey JA, Carlson KL, et al. Teasing and bullying experiences of middle school students. J Am Psychiatr Nurses Assoc. 2004;10(4):165–172. Ryan-Wenger NA, Sharrer VW, Campbell KK. Changes in children’s stressors over the past 30 years. Pediatr Nurs. 2005;31(4):282–288, 291. Sharrer VW, Ryan-Wenger NA. School-age children’s self-reported stress symptoms. Pediatr Nurs. 2002;28(1):21. Carter JS, Garber J, Ciesla JA, Cole DA. Modeling relations between hassles and internalizing and externalizing symptoms in adolescents: a four-year prospective study. J Abnorm Psychol. 2006;115(3):428–442. Compas BE, Malcarne VL, Fondacaro KM. Coping with stressful events in older children and young adolescents. J Consult Clin Psychol. 1988;56(3):405–411. Grant KE, Compas BE, Thurm AE, et al. Stressors and child and adolescent psychopathology: evidence of moderating and mediating effects. Clin Psychol Rev. 2006;26(3):257–283. Rutter M. Implications of resilience concepts for scientific understanding. Ann N Y Acad Sci. 2006;1094(1):1–12. Kabat-Zinn J, Massion AO, Kristeller J, et al. Effectiveness of a meditation-based stress reduction program in the treatment of anxiety disorders. Am J Psychiatry. 1992;149(7):936–943. Chong CS, Tsunaka M, Tsang HW, Chan EP, Cheung WM. Effects of yoga on stress management in healthy adults: a systematic review. Altern Ther Health Med. 2011;17(1):32–38. Sharma M. Yoga as an alternative and complementary approach for stress management: a systematic review. J Evid Based Complementary Altern Med. 2014;19(1):59–67. Kirkwood G, Rampes H, Tuffrey V, Richardson J, Pilkington K. Yoga for anxiety: a systematic review of the research evidence. Br J Sports Med. 2005;39(12):884–891; discussion 891. Li AW, Goldsmith CA. The effects of yoga on anxiety and stress. Altern Med Rev. 2012;17(1):21–35. Pilkington K, Kirkwood G, Rampes H, Richardson J. Yoga for depression: the research evidence. J Affect Disord. 2005;89(1–3):13–24. Butzer B, Ebert M, Telles S, Khalsa SB. School-based yoga programs in the United States: a survey. Adv Mind Body Med. 2015;29(4):18–26. Khalsa SB, Butzer B. Yoga in school settings: a research review. Ann N Y Acad Sci. 2016;1373(1):45–55. Ferreira-Vorkapic C, Feitoza JM, Marchioro M, Simoes J, Kozasa E, Telles S. Are there benefits from teaching yoga at schools? A systematic review of randomized control trials of yoga-based interventions. Evid Based Complement Alternat Med. 2015;2015:345835. Black DS, Fernando R. Mindfulness training and classroom behavior among lower-income and ethnic minority elementary school children. J Child Fam Stud. 2014;23(7):1242–1246. Zenner C, Herrnleben-Kurz S, Walach H. Mindfulness-based interventions in schools-a systematic review and meta-analysis. Front Psychol. 2014;5:603. Mendelson T, Greenberg MT, Dariotis JK, Gould LF, Rhoades BL, Leaf PJ. Feasibility and preliminary outcomes of a school-based mindfulness intervention for urban youth. J Abnorm Child Psychol. 2010;38(7):985–994. Wang D, Hagins M. Perceived benefits of yoga among urban school students: a qualitative analysis. Evid Based Complement Alternat Med. 2016;2016:8725654. Butzer B, Day D, Potts A, et al. Effects of a classroom-based yoga intervention on cortisol and behavior in second- and third-grade students: a pilot study. J Evid Based Complementary Altern Med. 2015;20(1):41–49. Sanders MG. Community involvement in schools. Educ Urban Soc. 2003;35(2):161–180. Greenberg MT, Weissberg RP, O’Brien MU, et al. Enhancing school-based prevention and youth development through coordinated social, emotional, and academic learning. Am Psychol. 2003;58(6–7):466–474. Payton JW, Wardlaw DM, Graczyk PA, Bloodworth MR, Tompsett CJ, Weissberg RP. Social and emotional learning: a framework for promoting mental health and reducing risk behavior in children and youth. J Sch Health. 2000;70(5):179–185. Sheldon SB. Linking school–family–community partnerships in urban elementary schools to student achievement on state tests. Urban Review. 2003;35(2):149–165. Bryan J. Fostering educational resilience and achievement in urban schools through school-family-community partnerships. Professional School Counseling. 2005:219–227. Birmaher B, Brent DA, Chiappetta L, Bridge J, Monga S, Baugher M. Psychometric properties of the Screen for Child Anxiety Related Emotional Disorders (SCARED): a replication study. J Am Acad Child Adolesc Psychiatry. 1999;38(10):1230–1236. Schonert-Reichl KA, Oberle E, Lawlor MS, et al. Enhancing cognitive and social-emotional development through a simple-to-administer mindfulness-based school program for elementary school children: a randomized controlled trial. Dev Psychol. 2015;51(1):52–66. Urbaniak GC, Plous S. Research Randomizer (Version 4.0) [Computer Software] Available from: http://www.randomizer.org/. 2013. Accessed June 22, 2017. Bastiaansen D, Koot HM, Bongers IL, Varni JW, Verhulst FC. Measuring quality of life in children referred for psychiatric problems: psychometric properties of the PedsQL 4.0 generic core scales. Qual Life Res. 2004;13(2):489–495. Bickman L, Athay MM, Riemer M, et al. Manual of the Peabody Treatment Battery. 2nd ed. 2010. Vanderbilt University, Nashville, TN, USA. Available from: https://peabody.vanderbilt.edu/docs/pdf/ceci/ptpb_2nd_ed/PTPT_2010_Entire_Manual_UPDATE_31212.pdf. Accessed June 5, 2017. Varni JW, Seid M, Rode CA. The PedsQL: measurement model for the pediatric quality of life inventory. Med Care. 1999;37(2):126–139. Varni JW, Seid M, Kurtin PS. PedsQL 4.0: reliability and validity of the pediatric quality of life inventory version 4.0 generic core scales in healthy and patient populations. Med Care. 2001;39(8):800–812. Moriarty DG, Zack MM, Kobau R. The centers for disease control and prevention’s healthy days measures-population tracking of perceived physical and mental health over time. Health Qual Life Outcomes. 2003;1:37. Burton P, Gurrin L, Sly P. Extending the simple linear regression model to account for correlated responses: an introduction to generalized estimating equations and multi-level mixed modelling. Stat Med. 1998;17(11):1261–1291. Hanley JA, Negassa A, Edwardes MD, Forrester JE. Statistical analysis of correlated data using generalized estimating equations: an orientation. Am J Epidemiol. 2003;157(4):364–375. Rotnitzky A, Jewell NP. Hypothesis testing of regression parameters in semiparametric generalized linear models for cluster correlated data. Biometrika. 1990;77(3):485–497. Zhang H, Xia Y, Chen R, Gunzler D, Tang W, Tu X. Modeling longitudinal binomial responses: implications from two dueling paradigms. J Appl Stat. 2011;38(11):2373–2390. Dariotis JK, Cluxton-Keller F, Mirabal-Beltran R, Gould LF, Greenberg MT, Mendelson T. “The program affects me ‘Cause it gives away stress’: urban students” qualitative perspectives on stress and a school-based mindful yoga intervention. Explore (NY). 2016;12(6):443–450. Dariotis JK, Mirabal-Beltran R, Cluxton-Keller F, Gould LF, Greenberg MT, Mendelson T. A qualitative evaluation of student learning and skills use in a school-based mindfulness and yoga program. Mindfulness (NY). 2016;7(1):76–89. Hagins M, Haden SC, Daly LA. A randomized controlled trial on the effects of yoga on stress reactivity in 6th grade students. Evid Based Complement Alternat Med. 2013;2013:607134. Hagen I, Nayar US. Yoga for children and young people’s mental health and well-being: research review and reflections on the mental health potentials of yoga. Front Psychiatry. 2014;5:35.